Jacqui Letran is a Multi-Award Winning Author, International Speaker, Nurse Practitioner, and Founder of Teen Confidence Academy and Healing Minds. She is passionate about her commitment to guiding her clients to achieve remarkable success in their academic, personal, and professional lives. Through private sessions, group workshops, and keynote engagements, Jacqui teaches that success and happiness are achievable by all, regardless of current struggles and circumstances. A gifted and energetic leader, Jacqui dedicates her life’s work to helping her clients and students transform into happy, confident, and successful people. When not working with clients or writing, you can find her traveling in her RV, hiking with her dog or spoiling her three cats. She now lives in Asheville, North Carolina. Do you feel misunderstood? Do your parents just like to push your buttons? Jacqui Letran's 5 Simple Questions To Reclaim Your Happiness and Create Amazing Relationships For Life (Book One) is a practical guide for navigating teens' emotions. Using beneficial exercises, the reader will quickly learn how to process their feelings more analytically and constructively, giving them deep insight into their actions and the actions of those around them. Imagine what it would be like to be a confident, emotionally stable young adult. You feel understood and appreciated. Your life is no longer dictated by the drama that seems to be inevitable. Start with asking yourself the five questions within this workbook and watch how your life opens up! By applying the uncomplicated principles outlined in this book, you will be amazed at how much easier life can be. You can have great relationships without unnecessary drama, constant fights, and unfair punishments. Are you ready to break your negative relationship cycles? 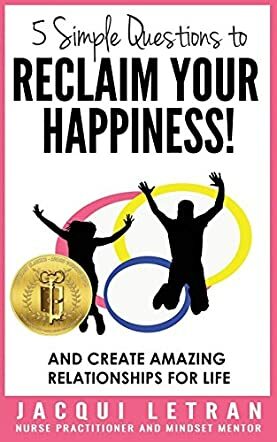 Jacqui Letran's 5 Simple Questions To Reclaim Your Happiness and Create Amazing Relationships For Life (Book One) is the first book in a three-book teen confidence series. Inspired by the author's own painful young adulthood, this book breaks down the emotional and thought processes that both teens and parents go through when struggling with an issue. With real-life examples and simple assignments to complete, this book is a valuable asset for both the teen and the parent. The author did an outstanding job of creating a safe place for teens to get in touch with and process their emotions in a positive environment. I would suggest this book for teens, their parents, or anyone that is tired of their negative emotions running their lives.